An interesting variation of the Indian dip, Sweet Tomato Chutney is a sweet, spicy and tangy sauce which has a wonderful mix of red tomatoes, spices et al. Here is how to make sweet tomato chutney recipe. It is not possible to savour a royal feast every day leave alone making it on a daily basis! But being a big time believer in the power of good, healthy and decadent meals, I always try and make at least one-two accompaniments with the simple meals of roti, sabzi, dal, chaawal that we relish every day. Isn’t it a good idea? That’s the reason why you would always find Masala Chaas, Kachumbar Salad, Sprout Salad, Pickles or Chutneys being served at my home – be it for us or for our guests. Out of all of these sides, my preferred one is chutney! Despite having tried umpteen versions of chutneys like Dhaniya aur Amle ki Chutney, Curry Leaves Coconut Chutney, Peanut Coriander Chutney, Sweet Tomato Chutney Recipe or Tamatar ki Meethi Chutney often gets made owing to its simple process and usage of the most common ingredients. The other chutneys recipes are up on the blog and do not forget to have look at them too. Chutney, as most of us know, is a sauce or a dip that is usually prepared using tomatoes, coriander, coconut, yogurt, mint and many other ingredients. 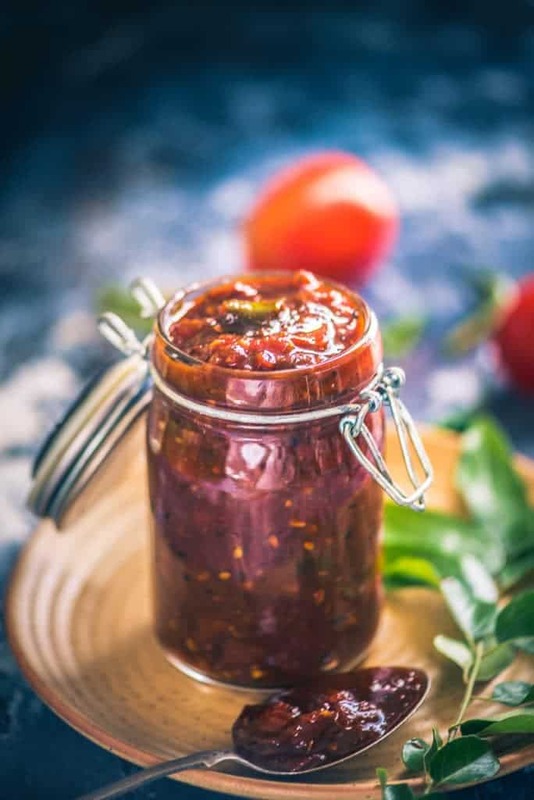 An interesting variation of the Indian dip, Sweet Tomato Chutney Recipe or Tamatar ki Meethi Chutney is a sweetish spicy sauce which has a wonderful mix of tomatoes, spices et al. The recipe to make this sweet tomato chutney takes just a few minutes of stirring and it comes together in no time. Choose bright red ripest tomatoes to make this chutney. Some people make this chutney with sugar but I prefer the taste of jaggery. Although this chutney is sweet, a little bit of salt is added to balance the flavours. Sweet Tomato Chutney Recipe or Tamatar ki Meethi Chutney for my kid is a desi version of ketchup, ha! He lovingly eats them with sandwiches or Potato and Cheese Balls as well. While I like to savour it with parathas or any other stuffed flatbread made for breakfast or lunch. Saying by my experience, you are sure to like the refreshing taste of Sweet Tomato Chutney Recipe or Tamatar ki Meethi Chutney, so, certainly make it this long weekend, here’s its sure shot recipe: Do give it a try and let us know how you liked it? To make Bengali Sweet and Sour tomato chutney, heat mustard oil in a pan. Add panch phoran and ginger and fry for a few seconds. Add chopped tomatoes. Cover and cook for 8-10 minutes. Add salt, sugar and water and cook for another 2-3 minutes. 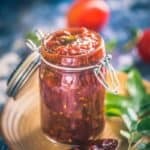 How to make Sweet Tomato Chutney with Dates? You can add 1/2 cup chopped seedless dates along with tomato and reduce the amount of jaggery a bit. This variation of tomato chutney tastes delicious too. Once the oil is hot, add hing, zeera, mustard seeds, kalonji, methi seeds and green chilli and let them crackle for a few seconds. Add ginger, chopped tomato, salt and red chilli powder and cook for 10-12 minutes. Add jaggery and cook for another 4-5 minutes until the chutney thickens and become dark in colour. Store the chutney in refrigerator for upto a week. An interesting variation of the Indian dip, Sweet Tomato Chutney Recipe is a sweetish tangy sauce which has a wonderful mix of tomatoes, spices et al. Here is a simple recipe to make it. Wash the tomatoes and chop them roughly.